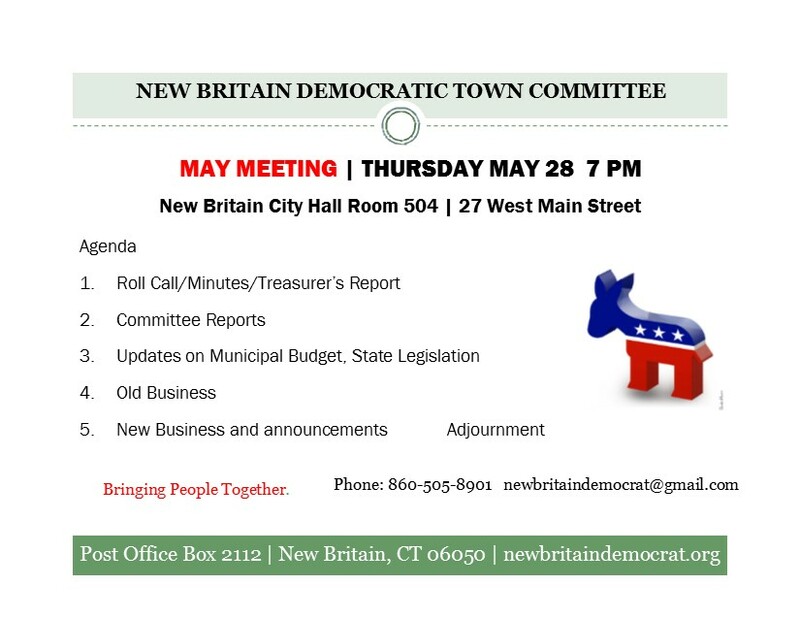 The Democratic Town Committee will meet on Thursday, May 28th at 7 pm for its May meeting. All Democrats are welcome to attend. The meeting will be held at New Britain City Hall, 27 West Main Street, Room 504. The state Legislature is in the last days of the 2015 session and budget negotiations are underway that will determine state aid amounts and tax relief to cities such as New Britain. The Common Council has a mid-June deadline to establish a city budget for the fiscal year that begins July 1st. An update will also be provided on the municipal nominations process. To date, 20 candidates have expressed interest in joining the Democratic slate to fill 27 positions. The nominating group will resume candidate interviews June 1st. McNamara was elected to the Board of Assessment Appeals in 2013 and is its Chairman. He is a former Chair of the city Building Commission and has led Democrats in the city since 1994. New Britain would be in line for an additional $8.8 million from the state for property tax relief if legislation advanced by State Senate Democrats and approved by a key committee wins approval of the Legislature and is signed by Governor Malloy. An Act Concerning Tax Fairness and Economic Development (SB 1), introduced by Senate President Martin Looney (D-New Haven), is one of the strongest measures introduced in many years to address the burdensome property tax. A key provision would change “the unfair and regressive car tax by establishing a permanent cap on the car tax in all towns. No car owner will pay more in car taxes, and no municipality will see a revenue loss as a result of this plan, ” according to Senate Democrats. The legislation, beginning with the 2015 assessment year (for taxes to be paid in FY 17), would allow municipalities to tax motor vehicles at a different rate than other taxable property, and would cap the motor vehicle rate at 29.36. Currently, New Britain taxpayers pay the 49 mill rate for both real and personal (car) taxes. The tax reform bill would address the loss of revenue from car taxes and return more aid to municipalities with a major overhaul of how the state shares aid to localities. It would “restructure the state’s payment in lieu of taxes (PILOT) programs by establishing minimum annual payments and a method for disbursing PILOT grants when appropriations are not enough to fund the full grant amounts. It establishes a mechanism for sharing state sales and use tax revenue in the Municipal Revenue Sharing Account (MRSA) with municipalities and the state’s nine regional councils of government (COGs). The Legislature must send up a state budget to Governor Malloy by June 3rd when the session ends. Absent a resolution of the new two-year state budget a special session is possible. This entry was posted in City Hall, Legislature, Meeting/Event, Municipal Budget, taxation and tagged CT General Assembly, Democrats, New Britain, property tax. Bookmark the permalink.